Read this great summary about the world of cork and its contribution to society and nature. First posted on www.corature.com. Every time you pull out your wallet to make a purchase, you essentially cast a vote for the Earth’s future. The echoes of its impact- for better or worse- will continue to reach future generations of young plants, animals, and humans. If you are someone who looks at ingredients and tags in search of the most Earth-friendly materials, cork should be at the top of your list- and it will be, once you hear its story. When you examine its ecology and get “under its skin”, so to speak, the power of this incredible sustainable material is impossible to ignore. Natural cork is something you can proudly wear and discuss when its unique look prompts those inevitable questions. This uniquely beautiful and durable product makes an unmistakable fashion statement, and it also helps to heal the Earth. An unassuming species of oak tree known as Quercus suber has been harvested since ancient Greece for the incredible material which lies just beneath its skin. When you choose cork products, you help to maintain the delicate balance of their forests, which conserve soil and water while reducing greenhouse gasses. The myth that cork trees are endangered could not be farther from the truth. 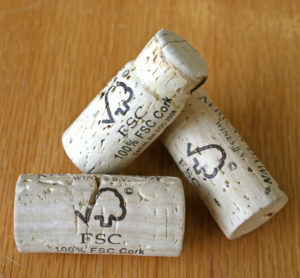 In fact, cork harvesting is the most sustainable and environmentally friendly type of forestry in the world. It is carried out entirely by the skilled hands of local workers rather than machines, producing an entirely recyclable product which is self-renewing. 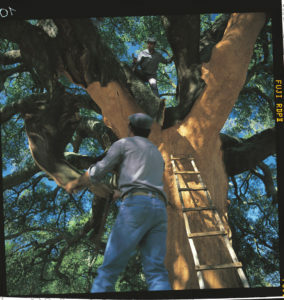 When a cork oak is 25 years old, its outer cork layer is carefully cut and stripped off, leaving the trunk unharmed. The same tree can yield a harvest every nine years, and live to be up to 200 years. This means that a single cork tree can be used to make roughly 1,000,000 wine stoppers over the course of its life. Cork forests can be found in Portugal, Spain, Morocco, Italy, France, and Algeria. The montado (cork oak forest) region of Southern Portugal is home to a thriving industry which produces more than half of the world’s cork. The trees in this area alone absorb about 14 million tons of CO2 every year. After a tree is stripped of its bark, it can take in roughly five times more CO2 than an un-harvested tree. Continuing the practice of the harvest protects these forests, and ensures that cork continues to be a plentiful, renewable resource. The soil in this region is sandy, and the groundwater sparse. 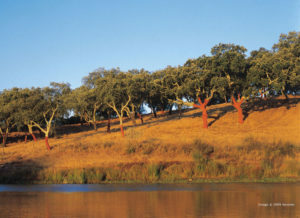 Cork oak trees help to prevent erosion and conserve the water supply. Without them, this area would become a desert. The montado is protected by a law written in 1209 which decrees that none of these special trees (whether living or dead) may be cut down. Hopefully this historic respect, along with our continued maintenance, will preserve the life of the montado- as long as the demand for cork continues. Cork oak forests are some of the most important ecosystems in the world because of the diverse range of species they give life to. Like the unique African Savana and the Amazonia regions, they exist in a delicate natural balance, and their survival is key for the continued safety of the creatures who call their branches home. The world’s cork oak forests support dozens of endangered species. Were it not for the preservation of these unique ecosystems, many species would face extinction. In North African cork oak forests, you’ll find the rare Barbary macaque. The black vulture and black stork are found in Spain’s cork woods, and the Barbary Stag in those of Tunisia and Algeria. Some species of birds have adapted to live exclusively in cork forests, where the canopies and open grasslands provide excellent places to nest and scavenge. In the montado region of Southern Portugal you will find a sprawling 1.8 million acres of cork forest. Protecting these regions protects the special animals who rely on them, including the critically endangered Iberian lynx and Iberian imperial eagle. Spiders, boars, deer, genets, geckos, snakes, wild cats, and mongoose are some of the other permanent residents who depend upon this fertile environment. The biodiversity supported by the montado is comparable to that of the Amazon rainforest. 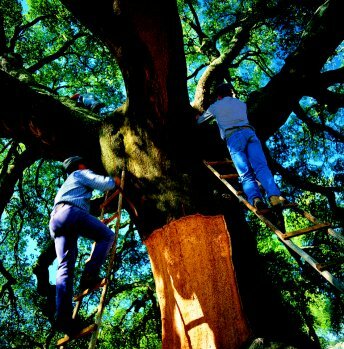 The cork oak is the only tree that can have its entire bark removed causing no harm to the tree –provided the workers wield their tools correctly. Cork harvesters, known as “triadors”, have a symbiotic relationship with the cork forest. Because the survival of the tree depends on their care and precision, proper cork harvesting is a skill that is taken extremely seriously. Young triadors apprentice for a year as the skill is passed down from one generation to the next. This skill is of such high value to the environment and the local economy, that triadors are some of the highest-paid agricultural field workers in the world. Using a specially designed axe called a “machada”, it takes one skilled worker about 10 minutes to strip the tree. While this process may seem quick, it can only be done during the optimal warm season once every nine years. It takes 25 years for young cork trees to reach the level of maturity for their first harvest, and the soft product it produces is only suitable for certain products. Wine stopper material comes from much older trees whose bark is dense enough to form a perfect seal. Each tree is inspected before harvesting to ensure the health of the tree and the highest quality of yield. After the bark has been successfully extracted, the triador marks the trunk with a single number representing the year of the harvest to ensure the tree is given a full nine years to regrow. The planks are then dried, and shipped off to be boiled and processed by the workers at one of many Portugal cork factories. At this critical moment in the Earth’s changing balance, environmental awareness is not so much a choice as a reality. Where you choose to spend your money, and on what type of products, has a widespread effect on the sustainability of natural resources. Choosing a cork product is a vote to preserve cork forests, the workers who make their living there, and the endangered animals who call them home. Demand for sustainable products is higher than ever, and we as consumers are waking up to the impact each of our choices makes on the collective whole of Earth. We are also living in a time in which we have more choice than ever, and looking for materials we feel good about buying, using, and promoting. Investing in sustainable products is one of the most empowering ways to create environmental change. Let’s start with cork.